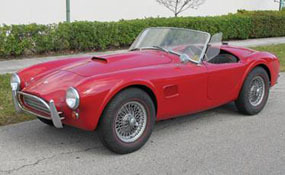 The three-day Collector Cars of Fort Lauderdale sale returns to the Greater Fort Lauderdale / Broward County Convention Center March 4th, 5th and 6th 2011 with an impressive range of automobiles and motorcycles, including a barn-find 1963 Shelby Cobra (CSX 2080), estimate: $425,000 - $475,000. With only two private owners from new and parked since 1981, the matching-numbers CSX 2080 is one of the most originalCobras in existence. The red exterior and black interior of CSX 2080 have been left untouched, but the car is road ready having recently undergone a complete mechanical restoration of its factory-installed powertrain.